Tis the season for claims that the universe is a hologram again. Just to be clear, there’s no observational evidence that the universe is a hologram, and the latest research driving the sensational headlines doesn’t claim that there is. But there is some interesting theoretical work regarding the holographic principle that is worth discussing. The holographic principle argues that the information contained within a region of space can be determined by the information at the surface that contains it. For example, imagine a road 10 miles long that is “contained” by a start line and a finish line. Suppose the speed limit on this road is 60 mph, and I want to determine if a car has been speeding. One way I could do this is to watch a car the whole length of the road, measuring its speed the whole time. But another way is to simply measure when a car crosses the start line and finish line. At a speed of 60 mph, a car travels a mile a minute, so if the time between start and finish is less than 10 minutes, I know the car was speeding. 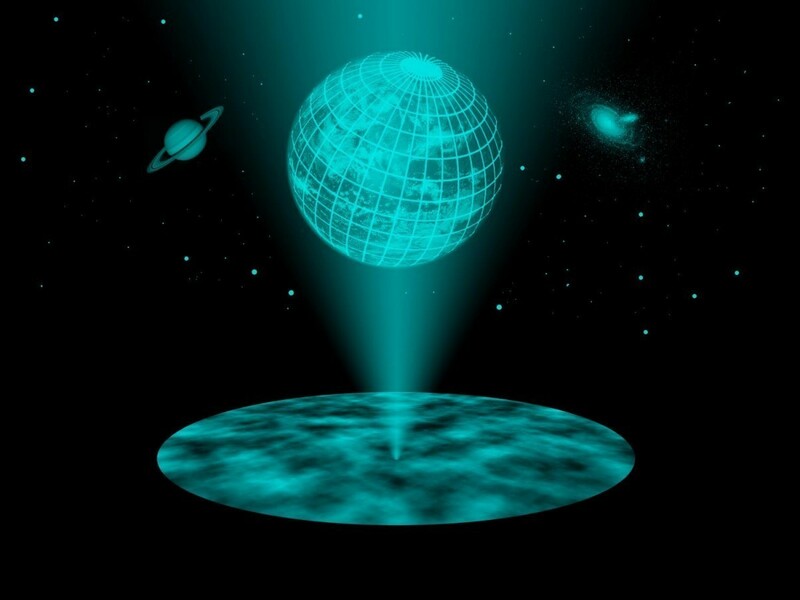 Mathematically, the space can be represented as a hologram of the surface that contains it. Unfortunately the term hologram invokes images of virtual reality and the idea that we’re living in the Matrix, which couldn’t be farther from the truth. As a theoretical tool the holographic principle is useful because it is easier to do some calculations on a boundary than it is on the enclosed volume. One of the most popular uses of the principle is in string theory, through something known as the AdS/CFT correspondence, which uses the holographic principle to connect the strings of particle physics string theory with the geometry of general relativity. The AdS stands for anti-deSitter space, which is a non-flat model universe. Anti-deSitter space can’t be used as a model for the physical universe, because we know observationally that the universe is extremely flat. It would be nice if there were a similar holographic correspondence for a flat universe model, but proving one has been difficult. Now a new paper has shown that the holographic principle can apply to flat space models, at least in some cases. The team looked at an aspect of quantum theory known as entanglement. If two objects such as electrons are entangled, they can be described in quantum theory as a single entity. Entanglement is one of the more strange aspects of quantum theory, and leads to some strange predictions about the universe, but has been experimentally validated. What the team found was that a calculation in standard quantum theory of a particular entanglement property dealing with entropy gave the same result when done using a holographic version. In other words, the standard and holographic versions are mathematically equivalent. They did these calculations in a model universe that’s flat, which demonstrates the holographic principle can work in flat space. This is not a general proof, and it doesn’t show that the holographic principle does work for a flat universe like ours, only that it might when it comes to quantum systems. There’s a lot more work to do before anyone can say with certainty that there is a flat space version of AdS/CFT correspondence. And even then it won’t mean the universe is a hologram. Always nice to read these explanation articles that put the popular science articles in a proper perspective. Thanks for providing this service to the uneducated fans of science! You seem very sure about this but do you have any proofs our world is not a simulation? Dark matter, gravity, spooky action at a distance…..it does not look to me like we can exclude the simulation just yet. Like our computer simulations…..you will never know you are inside one. Well you seem to not have any proof that our world is a simulation either. No one does, and you have to realize how many bytes of information as well as how much energy would required to make a computer simulation so good that no one would be able to tell the difference. Also, since you mentioned “The Matrix,” if you recall, in the Matrix there glitches in the system, ones that had to be fixed before anyone inside would notice. There was an animated short on the Animatrix that explored this, it was called “Beyond,” and it was all about these kids exploring this ‘haunted’ house which was actually just a glitch in the Matrix, which is why they were able to do all kinds of weird stuff while inside or near that house. So if our world really was a computer simulation, then there would be glitches (big or small) and there would be incidents like the ones portrayed in “Beyond,” since any computer program, even one as complex and intricate as the Matrix have gitches or bugs; but that’s not we see. So it is because of that reason that it is very clear to me that aren’t living in a computer simulated reality, and anyone who thinks this has no solid evidence of it, and it just shows me that the movie, “The Matrix” only served to make people question their existence and question reality all in the wrong ways. Never stops with the let me clarify attitude, these continued arrogant articles in which you try and lord your knowledge of the “actual science” of the subject over other internet or magazine science writers is getting ridiculous. I understand it’s a way to get readers to click on your link instead of the other thousand science writers that have popped up the last few years. I just don’t understand your need to try and be the definitive voice of the Internet loud mouths. You have a degree, you don’t need to stoop to such questionable marketing tactics. The whole point is to create discourse about science. It doesn’t matter the details in which science writers or magazines promote the science. How you word your articles can be better. Always calling me arrogant when I address hyped stories in the news. Criticizing the tone rather than the content. Making it a personal attack rather than furthering the discussion. How you word your comments could be better. I totally agree with Brian’s comment to Bob. While I do think the tone of an article has relevance, I see absolutely nothing wrong with Brian’s tone. He’s obviously simply trying to explain some complex ideas to people who are not trained in the field. And, I appreciate that. The tone of Bob’s comment is needlessly and senselessly hostile, and I think it is important to object to this sort of thing, which sadly, is rampant on the Internet. I think such hostile comments make it more difficult for people to communicate with one another. The world would be a much better place without them. I’m not a physicist or mathematician, but I try to follow current ideas in both as a layperson and the above assertion bothers me. It bothers me because I have read that one way to describe the geometry of Special Relativity is with a Minkowski Space. I have also read that one way to visualize a Minkowski Space as a sausage with time as the length and the surface created by a slice as an AdS. I imagine, but could be wrong, that the curvature an Anti de Sitter Space is a variable parameter. Since the effects of Special Relativity only become observationally apparent at near light speeds couldn’t our observation that space is flat simply be an artifact of being in a not-near-light-speed intertial frame of reference with respect to most of the observables in the universe? And the corollary of course is that reality is in fact an Anti de Sitter Space?